In a simple and quiet ceremony after the flag was hoisted this Monday morning at the third floor lobby of the Maritime Industry Authority (MARINA) in Parkview Plaza, Dr Maximo Q. Mejia Jr hands over the blue MARINA flag, the agency’s symbol of authority, to new Administrator Dr. Marcial Quirico C. Amaro III. Amaro, prior to joining the MARINA, was vice president for Chelsea Ship Management and Marine Services Corporation where he led and managed all the company’s vessel operations safely, economically, and efficiently maintained its operational requirements to standard, encompassing either the owner or charter parties and/or other commercial contracts, including those administrative in nature. He has served under various private shipping companies mostly as a consultant in his capacity as internal auditor, inspector and later on as accident investigator. A seafarer himself, he graduated with a degree in BS Marine Transportation (BSMT) and majored in steam engineering and electricity at the Philippine Merchant Marine Academy (PMMA) in 1982, Amaro served for both domestic and international vessels of different types. He worked his way from Fourth Engineer to Chief Engineer from 1982 to 1992. By the time he was managing operations for the Philippine Transmarine Carriers, Inc. from 1992 to 1997, where he covered about 54 vessels and 800 Filipino crew, he was also project consultant for the International Maritime Organization (IMO) for a year starting 1995 and was involved in the computerization of the Professional Regulation Commission (PRC) Board Examination for Marine Engine Officers under project name “National Marine Examination and Certification of Seafarers Philippines.” He developed questionnaires in multiple choice formats for all levels in the marine engineering licensure examination. Amaro then moved to conduct valuation and condition surveys to different types of vessels and also conducted audits for ISM Code Certification (DOC and SMC) as a Surveyor/Assessor for the American Bureau Shipping-Marine Services, Inc. until year 2000. In the next three years, he was with Lloyd’s Register Quality Assurance as an Industry Expert/Coded Assessor and conducted audits for quality management systems for ISO 9001 and environment management systems for ISO 14001, particularly in the fields of adult learning or higher education, travel and tours, ship management, manning agencies, power generating plants and water transportation. By 2003, he became Consultant for the Petron Bataan Refinery where he conducted seminars on “Vessel Safety Inspection,” “Ship-to-Shore Safety Interface,” and other similar courses on safety to all personnel involved in oil movement and storage and marine termination operation at the refinery. Amaro was instrumental in the development of terminal safety manuals and guides to port entry. In 2005, he started the conduct of annual suitability and safety inspections to 48 chartered coastwise vessels using the Oil Companies International Marine Forum Ship Inspection Report (OCIMF-SIRE) Program when he became Consultant for the Supply and Operations Division of Petron Corporation until 2007. At the same time, in 2004 he was Lead Auditor for the Anglo-Japanese-American Registrar, Inc. until 2007, where he conducted similar audits particularly in the fields of liquefied natural gas (LNG) power generating plants, plastics and cartons manufacturing, information technology and electronics, manpower agencies development and training centers, and seaport facilities. For six years until 2013, Amaro was Marine Manager/Head of Vetting for Petron Corporation, responsible for maintaining maritime safety, security and protection of the environment by implementing national and international standards, rules and regulations on safety, security and environment protection that covered 60 ships and 24 terminals in the Philippines. During that time, he conducted annual vessel inspections and ship vetting to an average of 500 overseas/foreign vessels calling Petron marine depots and terminals. He conducted ISM/TMSA audits to vessel owners and operators and organized training seminars on depot management and ship-to-shore interface and assisted other Petron business units on maritime matters and ship business. Amaro was SIRE Category 1 Inspector from 2010 to 2013. He was also actively involved with the Technical Education and Skills Development Authority (TESDA), where he was responsible for the development of TESDA training regulations and assessment tools, and defended the same before the TESDA Board. He headed the National Inspection Team in monitoring 45 maritime schools and 20 assessment centers sanctioned by TESDA, in relation to their compliance with established training regulations. He was also a member of the Technical Expert Panel of TESDA for the National Capital Region and part of making sure that the TESDA quality system in all its activities were complied with. He was independent ship inspector/auditor after his stint with Petron and conducted pre-SIRE audits, TMSA audits, SMS/ISPS/MLC internal audits to his clients. Working with clients, he was auditor, inspector and accident investigator, also with the Liberian International Ship and Corporate Registry and represented the company in providing maritime services to clients domestically and among nearby Asian countries in the issuance of documents pertaining to compliance with ISM, ISPS and MLC. He provided them support in terms of training and the conduct of investigations to marine casualties and incidents. Amaro was also lecturer at the DNVGL Maritime Academy Philippines for courses: Internal Auditor ISM-ISPS-MLC for Shipping Companies; Internal Auditor ISM to ISO 9001, ISO 14001 and OSHAS 18001; Accident Investigation in Shipping; Maritime Risk Management; and Flag State Regulations. He co-authored two books used in BSME courses: (1) Maritime Thermodynamics 1; and (2) Mechanics and Hydromechanics. He completed his coursework as Master in Shipping Business Management at the Philippine Merchant Marine Academy in 2003. He is also a Commissioned Naval Officer, Reserved, with the rank of Captain at the Philippine Marine Corps. He went through airborne training, is a combat scuba diver, rainbow ranger and expert rifle shooter. He completed his Doctorate in Philosophy-Management in 2011 at the International Academy for Management and Economics in Makati City. He passed the UK National Examination Board for Occupational Safety and Health Certification in 2013. He is the first in the Philippines to receive DnV Certificate of Competence for Ship Superintendent in 2006 and was also the recipient of the Most Outstanding Seafarer of the Year Award in 2003. He is an accredited inspector/surveyor, accident investigator and lead auditor and certified lead auditor for ISO 9001, 14001, 22000, and OHSAS 18001. Amaro was born in Iriga City on 23 August 1961 and is married to Evangeline Nucum Pare. They are blessed with three sons who are now in their 20s. He is a born-again Christian. Dr. Maximo Q. Mejia Jr, Administrator of the Maritime Industry Authority (MARINA), and Mr. Jorge Barakat Pitty, Administrator of the Panama Maritime Authority, sign the Memorandum of Agreement (MoA) on mutual recognition of STCW certificates. The MoA lays out the conditions, duties, and responsibilities of each party for the recognition of STCW certificates. Admin. Mejia refers to it as “yet another landmark in relations between the world’s biggest seafaring nation and the world’s biggest ship registry.” Admin. Barakat, on the other hand, lauds the great benefit derived by world commerce from the close cooperation between the two maritime nations. The MoA was signed on International Seafarers Day, Saturday the 25th of June 2016, in Panama City, Panama. The Philippine delegation consist of Dr. Maximo Q. Mejia Jr, who was designated Special Envoy of the President of the Republic of the Philippines to the Inauguration of the Expanded Panama Canal, and Mr. Angelo Amonoy, First Secretary at the Embassy of the Philippines in Mexico. “We greatly appreciate the presence of Filipino seafarers in global shipping,” says IMO Secretary-General Kitack Lim. He joins the Filipino seafarers in celebrating the International Day of the Seafarer and the Day of the Filipino Seafarer at the same time at Function Rooms 4 and 5 of the SMX Convention Center in Pasay City, Manila, today, 25 June 1016. JUNE 25 is observed worldwide as the Day of the Seafarer; it is also the Day of the Filipino Seafarer. In 2010, the International Maritime Organization (IMO), designated June 25th as the International Day of the Seafarer as a way to acknowledge the unique contribution made by seafarers to international seaborne trade, the world economy and to global society as a whole. Also, President Benigno Aquino III signed Proclamation No. 183 declaring June 25 of every year as the “Day of the Filipino Seafarer” on 3 June 2011. This year’s event celebrates the incredible impact that Seafarers make for the world. First celebrated in 2011, following its establishment by a resolution adopted by the Conference of Parties to the International Convention on Standards of Training, Certification and Watchkeeping for Seafarers (STCW), held in Manila, Philippines, in June 2010, which adopted major revisions to the STCW Convention and Code, the International Day of the Seafarer is now included in the annual list of United Nations Observances. “At Sea For All”, the theme for IMO’s Day of the Seafarer campaign is linked with the 2016 World Maritime Day theme, “Shipping: indispensable to the world”, emphasizing that seafarers serve at sea not just for the shipping industry or for their own career purposes but for all of us – and, consequently, they are also “indispensable to the world”. The day also aims to bring global attention to the issues affecting their work and lives, such as piracy. It calls on governments to develop policies that lead to fair treatment of seafarers at ports, and asks private ship companies and owners to provide their employees proper facilities and comforts while they are at sea. According to IMO estimates, ships transport almost 90 percent of the world’s goods trade. Seafarers are not only responsible for the operations of such ships, but are also responsible for the safe and smooth delivery of the cargo. The North Western University welcomes STCW Forum speakers, guests, and coordinator to host the Usapang STCW Forum in its Media Room where a mix of students numbering more than a hundred attends the awaited talks. Atty. Herschel F. Magracia presents the historical and legislative background that led to the creation of a single maritime administration through the enactment of Republic Act 10635. He explains that through R.A. 10635, the Maritime Industry Authority (MARINA) is empowered by law to deal with all issues pertaining to the standards of training, certification, and watchkeeping for seafarers. Atty. Magracia also expounds that the MARINA, through R.A. 10635, assumes all powers and functions of the Professional Regulation Commission (PRC), Commission on Higher Education (CHED), Technical and Skills Development Authority (TESDA), Department of Health (DOH) and the National Telecommunications Commission (NTC), relative to the issuance, validation, verification, correction, revocation or cancellation of certificates of competency, endorsement or cancellation of certificates of competency, endorsement, proficiency and documentary evidence required of all seafarers and all such other matters pertaining to the implementation of the oversight in the implementation of the STCW Convention 1978, as amended. Meanwhile, Atty. Jabeth Sena Jepath A. Dacanay provides updates on developments that MARINA undertakes to create accessible points for seafarers to process their documents. She also explains that the course and skills upgrades required by MARINA with CHED are part of the mandate set in the law to ensure compliance with International Conventions on the Manila Amendments and all international agreements implementing or applying the STCW Convention, and other international maritime safety conventions or agreements that the STCW Convention seeks to promote compliance with. 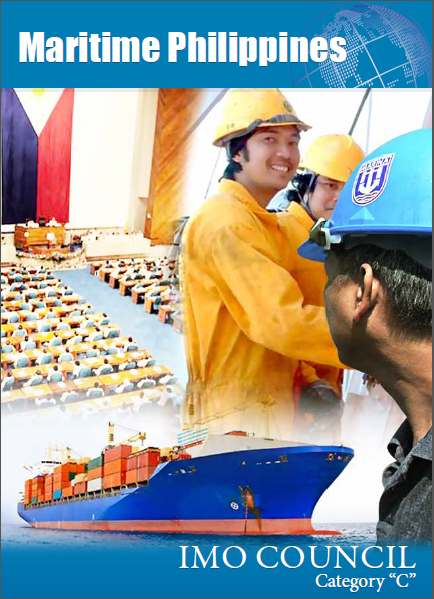 The Manila Amendments seeks for continuous upgrade of seafarers worldwide in both technical and management skills after five years in order to keep alongside technological progress in shipping and ship management. It is also the reason Atty. Dacanay directs the maritime students to seek for higher positions in seafaring upon skills updating. “We want to see Filipino seafarers in command of great ships and key to this pursuit is our continued compliance with the STCW Convention. Our maritime education and training must not only prepare our cadets and cadettes to pass the standards, but to prepare them for the real life situations at seas. Learning then must aim at supporting our cadets/cadettes reach their full potentials in their chosen field, become experts and educators, able to transfer their knowledge and expertise to the future,” Atty. Dacanay says further. From the STCW Office are Ms. Josephine O. Castillo, Officer-in-Charge of the Examination and Assessment Division and Mr. Herbert V. Nalupa, Officer-in-Charge of the Public Information Division. 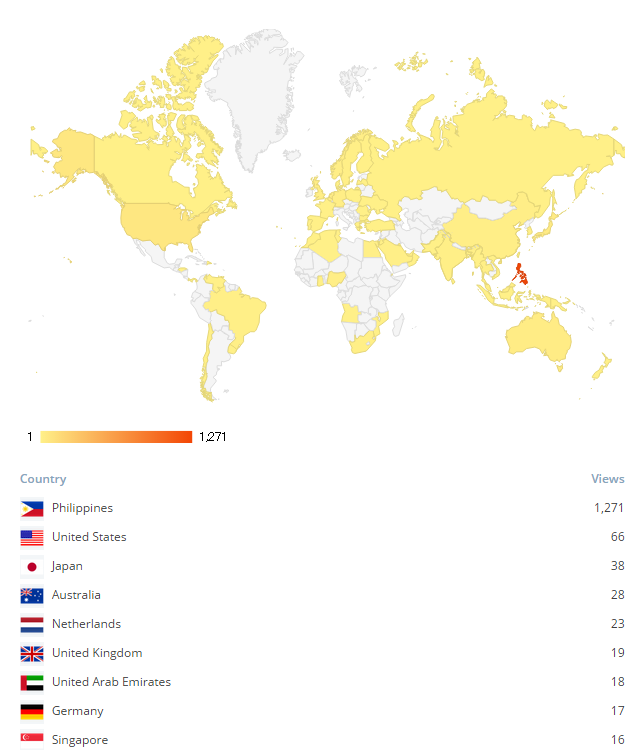 The Usapang STCW Forum is a regular weekly forum with stakeholders that aims to clarify pressing issues on standards of training, certification, and watchkeeping for seafarers and a venue for the MARINA to present status of developments it undertakes. 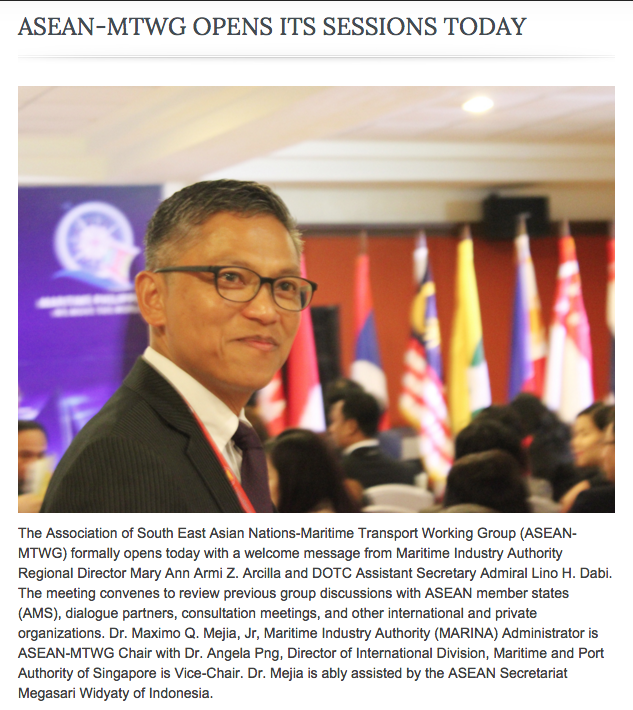 At 10 AM today, the ASEAN Maritime Transport Working Group meets for the last of a three-day stint to discuss, review and finalize plans and programs that will serve as part of a program schedule for the enhancement of trade and economic activities in the ASEAN region where maritime transport plays a major role. Dr. Maximo Q. Mejia Jr, Maritime Industry Authority (MARINA) Administrator and Chair of the working group takes pride in the accomplishments achieved in the meeting and expresses his gratitude and appreciation to the delegations for electing him to steer its course. He also commends and is grateful for the support of all allied and affiliated agencies throughout the duration of the event and formally concludes the meeting by 12 noon. He is ably assisted by ASEAN Secretariat Megasari Widyati and Philippine Secretariat Atty. Jean Ver Pia, Director of Overseas Shipping Service of the MARINA. First of four maritime transport working group meetings, the Philippines as host shall, in an interval of six months, provide venue to the transport working group meetings while at the same time showcase tourist locations, homegrown crafts and delicacies, and the Filipino culture. Social activities were added during the event “to forge new bonds, delight in the pleasure of each other’s company, and enjoy the island of Boracay, though briefly,” Dr. Mejia says in his closing remarks and invites the delegates to return anytime to enjoy the beauty the rest of the country promises. The ASEAN MTWG is made possible through the support and assistance of the Department of Transportation and Communications, the Philippine Coast Guard, the Philippine National Police, the Philippine Ports Authority, the Department of Tourism, the Department of Health, and all their regional counterparts, the local secretariat composed of the full force of MARINA from both central and regional offices and local government units. Varied blues. An early morning view of a typical day’s business from the shore of Boracay Island. Stores on shore begin setting up implements to attract more clients. Picking up from the requirements set during the 40th Senior Transport Officials Meeting (STOM), the 21st ASEAN Transport Ministers (ATM) Meeting, and other ASEAN coordinating bodies, follow through actions on some agenda items feature: (1) the establishment of single shipping market; (2) current arrangements for Standards of Training, Certification and Watchkeeping for Seafarers (STCW) on near coastal voyages limits; (3) implementation progress of the Master Plan and Feasibility Study on the Establishment of ASEAN RO-RO (roll-on-roll-off) Shipping Network and Short Sea Shipping; (4) enhancement of maritime safety for the establishment of efficient shipping routes; (5) support formulation and implementation of ASEAN Oil Spill Response Action Plan; (6) sustainable ports development; and (7) maritime transport agreement with India. The ASEAN Maritime Transport Working Group (ASEAN-MTWG) elevates all the studies and findings already discussed to the Senior Transport Officials Meeting (STOM), which, when all issues have been satisfied, will then raise their conclusions to the ASEAN Transport Ministers (ATM) and other ASEAN coordinating bodies. The ASEAN-MTWG is the group tasked to conduct further study on findings that need in-depth planning, preparation, and analysis. By the end of this conference, the body shall come up with a final report that will be considered and adopted for the Senior Transport Officials Meeting. The Philippines shall host three more Maritime Transport Group meetings within six months of interval, until 2017. Dialogue partners include India, Japan, China and Republic of Korea. Other meetings that coordinate and come up with strategic plans, policies and best practice systems are the following: ASEAN Port Association; Federation of ASEAN Shipowners Association; ASEAN-India Maritime Transport Cooperation; ASEAN-Japan Cruise Promotion Strategy; Philippine-Japan Meeting on the Implementation of Electronic Data Interchange (EDI) in ASEAN ports; Representative from the Ministry of Land, Infrastructure, Transport and Tourism (MLIT) of Japan for the ASEAN-Japan Transport Partnership Work Plan 2015-2016; Port Technology Group Meeting with Japan; Representatives from Ministry of Land, Infrastructure and Transport (MOLIT) of the Republic of Korea; Bilateral meeting with Indonesia on ASEAN RO-RO route; Development Study for Inland Improvement with Cambodia, Lao PDR, Myanmar and Viet Nam (CLMV) and Thailand; dialogue partners to further improve linkage among countries in the Mekong region; ASEAN-Japan Port Security Expert Meeting; ASEAN-China Maritime Consultation Meeting; Global Task Force and Project Inception Meeting; the ASEAN Secretariat; country coordinators of the ASEAN Economic Community; Deutsche Gesellschaft für Internationale Zusammenarbeit (GIZ); International Maritime Organization (IMO); and the IMO-Global Initiative for South East Asia. THE OFFICIAL logos used for the 31st ASEAN-MTWG are the ASEAN logo (used with permission from the ASEAN secretariat) with the event name, venue and date. Meanwhile, Maritime Industry Authority Administrator Dr. Maximo Q. Mejia Jr directed the creation of the Philippine logo that will also be used to brand the event with local colors. The logo features a compass rose depicting the forward direction the maritime transport industry in the Philippines is taking; a vinta (local sailboat found in the southern part of the country), and a swash of wave the vinta rides on. Maritime Philippines is the theme portrayed and “We Move the World,” its tagline, is a statement that captures the essence of the strong seafaring industry. THE MARITIME Industry Authority (MARINA) will implement full compliance with STCW standards set in the Manila Amendments by January 1, 2017 — a clear message sent out during a dialogue dubbed “Usapang STCW (Standards of Training, Certification and Watchkeeping for Seafarers) Forum” in Cebu to maritime stakeholders: shipping and manning agencies; maritime higher education institutions (MHEIs); maritime training institutions (MTIs); maritime assessment centers (MACs); maritime training centers (MTCs); maritime students and seafarers. “Seafarers must not slack over their updating or refresher courses; they need to take it immediately in order to abide by the requirements set by the Convention in the Manila Amendments, as it is an international standard put in place by the International Maritime Organization in 2010,” stresses Atty. Jabeth Sena Jepath A. Dacanay, Deputy Executive Director of the MARINA STCW Office, and one of the panelists in the dialogue. She likewise enjoins the support of both manning and shipping agencies to require their seafarers to undergo the needed refresher or updating courses before the deadline. “Flocking to the MARINA offices on the eleventh hour will be a major remiss on your part as MARINA might not be able to accommodate the influx, should that scenario take place,” Atty. Dacanay says further. “As with the maritime colleges and training centers, the courses they provide must also be compliant with the requirements of the Convention to assure foreign principals that our seafarers are aligned with the skills and proficiency preconditions the international maritime shipping industry demands,” Atty. Dacanay explains. The dialogue kicks off with a presentation by Atty. Herschel F. Magracia of the historical background that marked the urgent need for a single maritime administration accountable for the standards of training, certification, and watchkeeping duties of seafarers, including, together with CHED (Commission on Higher Education), the monitoring and assessment of maritime higher education institutions, training centers and institutions, assessment centers and their trainers. Atty. Magracia is Director of the MARINA Enforcement Service and Officer-in-Charge of the MARINA STCW Office Legal Division. Usapang STCW is a regular weekly dialogue, every Thursday, between the STCW Office and stakeholders in venues held nationwide. It is a forum where questions are answered and other updates and relevant information are shared. The “Usapang STCW Forum” was held at the Convention Hall of the Sacred Heart Center in Cebu City, March 31, 2016, 9:30 AM. What is the Order of Sikatuna? CIA as transit point for seafarers?